PATEK PHILIPPE REF. 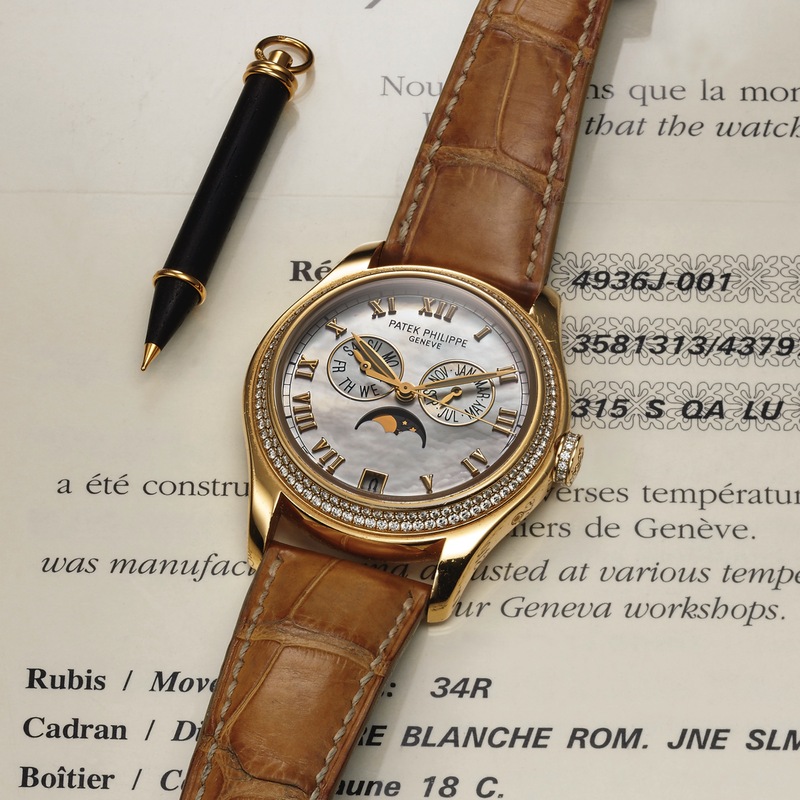 4936 MOTHER-OF-PEARL DIAL YELLOW GOLD AND DIAMOND Patek Philippe, Genève, "Annual Calendar," movement No. 3581313, case No. 4379707, Ref. 4936J. Made circa 2006. Very fine, center seconds, self-winding, water-resistant, 18K yellow gold and diamond wristwatch with annual calendar, moon phases and an 18K yellow gold Patek Philippe buckle. Accompanied the Certificate of Origin, setting pin, leather folder and instruction booklet. Two-body, concave bezel and winding crown set with 170 diamonds (around 1.00 ct.), concave lugs, correctors on the band, screwed-down transparent case back, sapphire crystals. Mother-of-pearl with applied luminous yellow gold radial Roman numerals, outer minute/ seconds track, subsidiary dials for the days of the week and the month, apertures for the date at 6 and the moon phases. Luminous yellow gold feuille hands. Cal. 315/297, stamped with the Seal of Geneva quality mark, rhodium-plated, fausses cotes decoration, 37 jewels, straight-line lever escapement, Gyromax balance adjusted to heat, cold, isochronism and 5 positions, shock absorber, self-compensating free- sprung flat balance spring, 18K gold rotor. C. Two-body, concave bezel and winding crown set with 170 diamonds (around 1.00 ct.), concave lugs, correctors on the band, screwed-down transparent case back, sapphire crystals. D. Mother-of-pearl with applied luminous yellow gold radial Roman numerals, outer minute/ seconds track, subsidiary dials for the days of the week and the month, apertures for the date at 6 and the moon phases. Luminous yellow gold feuille hands. M. Cal. 315/297, stamped with the Seal of Geneva quality mark, rhodium-plated, fausses cotes decoration, 37 jewels, straight-line lever escapement, Gyromax balance adjusted to heat, cold, isochronism and 5 positions, shock absorber, self-compensating free- sprung flat balance spring, 18K gold rotor. Dial, case and movement signed. DIAM. 37 mm. THICKNESS 11.5 mm.